There is no shortage of space to play in our amazing community. Our ballfield is perfect for an afternoon pick-me-up game of softball or an easy batting and catching practice session with Mom or Dad. We are proud to provide a practice space for soccer, t-ball and softball teams that are made up of mostly neighborhood kids and coached by a neighborhood parent. 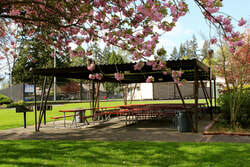 The covered picnic area maintains eight picnic tables and two bar-b-que grills for a fun summer gathering. Our members have hosted birthday parties, club bbqs, ladies happy hours, office picnics, and family gatherings. This gathering spot provides the perfect hosting space for our Memorial Day parade, egg hunt, swim team meets, board meetings and planning activities. Improvements continue, Please feel free to reach out if you have questions. We thank you in advance for keeping current on dues so we can serve you best. Some of our most beloved neighbors are those furry four-legged friends. While our residents love the ability to take their dogs to the park, ALL PETS MUST BE LEASHED IN ACCORDANCE WITH CITY OF KIRKLAND LEASH LAWS. Our park is NOT a designated off-leash park. Please keep them out of the playground and tennis courts and away from children and other pets. Please also remember that many people and especially children are frightened of dogs and off-leash dogs could cause undo anxiety or accidental injury. There are designated off-leash parks at Edith Moulton Park and Jasper's Park. For the most part residents are very respectful and clean up after their pets. Many neighbors along the park fence have reported more than usual pet waste and "gifts" in their immediate access to the park. However, because other neighborhoods do not allow pets in their parks those residents bring their dogs to our park. We ask that you model common sense practices and respectfully remind others that pets NEED to be cleaned up after. Ballfield for sports teams is available for reservation Monday-Thursday nights, with alternating timeframes in Spring and Fall, and Saturdays until 12pm. This allows for family/community to use fields. For sports teams: No reservations allowed for teams Fridays or Sundays during summer, which runs from Memorial Day weekend through Labor Day. All teams must have current insurance coverage certificate from sponsoring league. Must be on file with the Pool/Park Director. For picnic area reservations there is a refundable $50 fee pending completion and submission of clean up check list. Please allow 5-7 business days for request to be processed and a confirmation email to be sent. Reservation forms can be found here.